고마운 사람에게 항상 마음이 있으면서도 마음만큼 자주 연락하지 못하거나 쉽게 표현하지 못하는 경우가 많은데요. 생일, 명절 등 특별한 날을 맞이해 그동안 챙기지 못했던 안부를 나누거나 감사의 마음을 전해보면 좋을 것 같습니다. 오늘은 추석 맞이 다양한 영어 표현으로 마음을 전할 수 있는 문구들을 나눔 하고자 합니다. A moment of thanks for all that you do. Have a Happy Chuseok! 당신이 한 모든 것에 대해 감사드려요. 행복한 추석 맞이하시길요! Wishing you a holiday filled with love and joy. 당신에게 사랑과 기쁨으로 가득 찬 휴일이기를 기원합니다. So grateful to know someone like you. 당신 같은 사람을 알게 되어 너무 감사합니다. So happy to call you my friend. 너를 내 친구라고 불러서 행복해. I hope you and your family have a great Chuseok. 당신과 당신 가족이 즐거운 추석을 보내길 바랍니다. I am thankful[I’m very happy/I’m very lucky] for good friends like you. Have a Happy Chuseok! 당신 같은 좋은 친구가 있어서 감사합니다[너무 행복합니다/정말 행운입니다] 행복한 추석 맞이하시길요! Let your home be filled with the warmth of loved ones on this Chuseok! 추석에 당신의 집이 사랑하는 사람들의 온기로 가득 차길요! There’s nothing more heartwarming than spending this time with dear family and relatives[friends]. I hope you have a Happy Chuseok! 사랑하는 가족과 친척들[친구들]과 함께 시간을 보내는 것만큼 더 따뜻한 것은 없습니다. 행복한 추석 보내길 바래요! You’re such an important part of my life. 당신은 내 삶의 중요한 일부이에요. 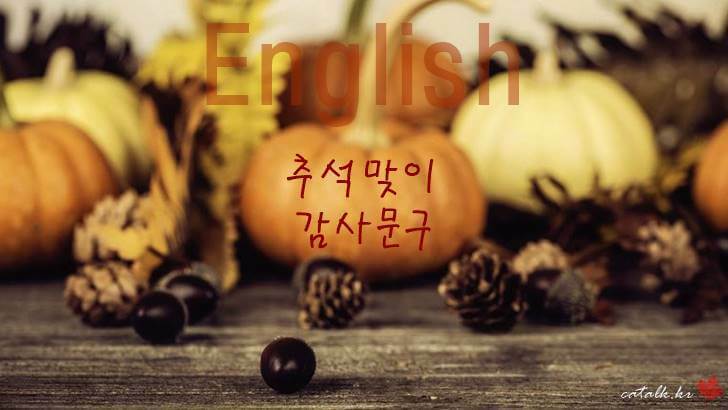 Have a great time with your family during the Chuseok holiday! 추석 기간 동안 여러분의 가족과 즐거운 시간을 보내세요! I feel very lucky to have you in my life. Have a great Chuseok! 내 인생에서 당신을 만나게 돼서 정말 행운이에요. 행복한 추석 되세요! May the many blessings of Chuseok bring you an outpouring of love and warmth. Happy Chuseok to you and yours. 당신에게 사랑과 따뜻함을 부어주는 추석의 많은 축복이 있길 바래요. 당신과 가족분 행복한 추석 보내시길요. I am thankful for the unconditional love and unwavering support you are giving me. Have a Happy Chuseok! 제게 주는 무조건적인 사랑과 변함없는 지지에 대해 감사드려요. 행복한 추석 맞이하시길요! 명절을 맞이해 사랑하는 사람에게 감사와 축복의 마음을 전하는 데에 조금이나마 도움이 되길 바랍니다. 영어 단어 본말보다 준말이 히트다, 히트!